Going through life with cataracts is like viewing the world through a foggy window. 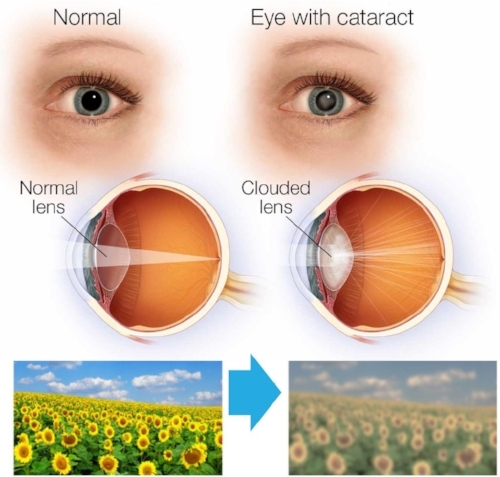 A cataract occurs when the natural lens in your eye becomes cloudy, obscuring the light entering your eye and making things appear out of focus. During cataract surgery, the affected lens is removed and replaced with a new lens, known as an intraocular lens (IOL). Alcon, the global leaders in eye care, introduced the ACTIVEFOCUS™ Toric IOL almost one year ago and have had huge success with the unique design. This multifocal lens can help you experience clear, crisp distance and intermediate vision, decreasing your need to wear glasses for common, everyday activities. "I recently had lens replacement surgery by Dr. Creekmore because of cataracts in both eyes. My vision had been getting very poor, making the effort to read anything very strenuous and discouraging. After my first replacement I was stunned, not at all expecting the clarity of objects, letters, and the contrast of shades of color. My computer was set on the largest and darkest print that I could get and that's not at all necessary now. After the second lens replacement with the Alcon ACTIVEFOCUS™ Toric lens I was even more surprised and excited. Besides being able to see so much better, these lenses made it unnecessary for me to wear glasses. Prior to cataract surgery I was having neck and back strain from the effort needed to read books, correspondence, the computer, paying bills and medication labels. Now reading is not a drudgery and more accurate. My handwriting has improved and texting is easier. Measuring and cutting are more accurate and require less effort to see lines and numbers due to shadows. All these things mean greater self-confidence, less anxiety and more self-esteem. The ACTIVEFOCUS™ Toric lenses have improved my quality of life"